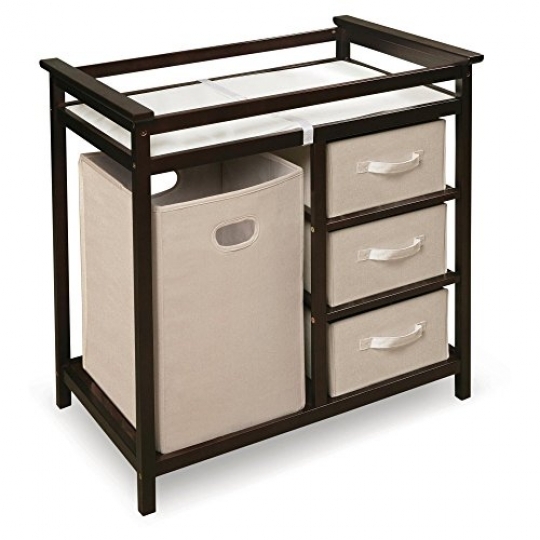 Keep baby and the nursery clean and tidy in one step by purchasing the Badger Basket Modern Changing Table. Constructed of wood and wood composites, this changing table is equipped with an integrated hamper bag and three pull-out storage baskets. Dirty laundry and baby's socks, onesies, and creams will always have a home here. A polyurethane foam changing pad on top comes with a safety belt and rails on each side for added security, but never leave baby unattended. Modern changing table with an integrated and removable hamper bag. 3 pullout baskets. Includes a polyurethane foam changing pad with a safety belt. Made from wood and wood composites. Poly cotton fabric. Safety rails. Wipe frame and surfaces clean with mild soap and a damp cloth. Spot clean baskets and hamper bag. Accommodates up to 30 pounds. Basket: 12.75L x 17W x 7H in.. Hamper: 13.5L x 14W x 21.75H in.. Overall: 34.25L x 20.75W x 34.5H in..